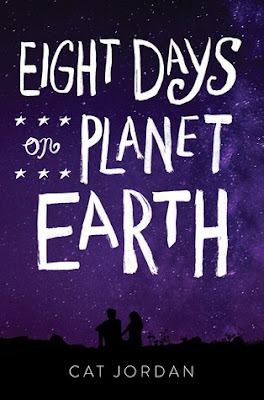 The first thing that drew me to Eight Days on Planet Earth by Cat Jordan was the science-fiction feel that I got while reading the summary of the book. I love a good book about space, and since it’s been a while since I’ve had the chance to read one, I was really looking forward to reading this one. I read and enjoyed Cat’s previous book The Leaving Season last year, so I had really high hopes for this one. The book was not at all what I was expecting, but was an enjoyable read none-the-less! As I mentioned above, I went into this book thinking that it was going to be a science-fiction type book, but it was actually more of a contemporary novel. (There were parts about space mentioned throughout the story though, and I really enjoyed those.) This was actually a pretty sweet contemporary novel that follows Matty through the loss of his father, who up and left out of the blue one hot summer morning, to his discovery of Priya, a girl claiming she was from outer space, in a field near his house one afternoon. (A field, I should also add, where a space ship crash landed a few decades before.) The book is full of surprises and revelations for both Matty and Priya over the course of the eight days, and it was interesting to follow the story through Matty’s eyes. Overall; While Eight Days on Planet Earth was not at all the book I was expecting, it was still an interesting book to read, and I’m glad I was able to fit it on my reading list for this month. I’ll definitely be keeping my eye out for more books by Cat in the future!